At Vestige, we believe in “Work smart, party harder” anthem. Every time we achieve a milestone; we celebrate it to the fullest to bond as a team. 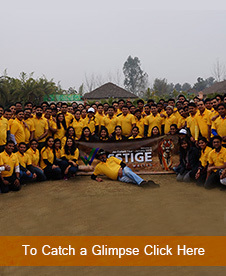 Our employees not only deliver their best but also feel like an integral part of the Vestige family. Quarterly Recreational Meets, Annual Trips, Festival Celebrations, Monthly Birthday Celebrations just to name a few. Join us and see for yourself! For us, it is the journey which matters and not the destination because travelling with a great company creates wonderful memories for a lifetime. Hence, Vestige ensures taking it employees to off-sites for much needed break and rejuvenation. From music to perfect dark coffee you will find unlimited fun in our office's premises. Besides, if you think you have the talent for singing, dancing, dramatics or playing musical instruments, or anything else, we have a perfect platform for you to come and showcase your talent.